Calley Cederlof, Education Reporter notes, "California Department of Education created a smartphone app with information on the state's schools. The CA Schools mobile app, created by California Department of Education, allows users to access information about the state's more than 10,000 schools. These days, technology is as influential in the classroom as textbooks, pencils and paper. Local educators use laptops, iPads, and smartboards to take learning to the next level. At home, students use websites to complete lessons and parents can view grades and check in with teachers. To provide even more information at the touch of a finger, California Department of Education created a smartphone application with data on the states more than 10,000 public schools. 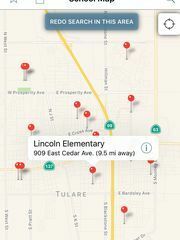 The CA Schools mobile app allows users to locate nearby schools based on their current location and provides a wealth of details, including contacts and directions, demographics, test scores, and a school’s California School Dashboard profile page.